It turns out bike-friendliness is second nature for Harvard University. Weeks after being named a Silver-Level Bike Friendly University by the League of American Bicyclists, Harvard University was recognized as a Gold-level Bike Friendly Business by Mayor Menino and the City of Boston. Representatives from Harvard’s Longwood campus were joined by Harvard’s Commuter Choice Program in receiving Gold-level awards from Transportation Commissioner Thomas Tinlin and Director of Boston Bikes Nicole Freedman. In total, 41 Boston businesses were recognized in the gold, silver, and bronze categories. Gold-level businesses must achieve 22 points on a criteria checklist that ranges from number of outdoor and secured indoor bike racks, bike commuter financial incentives, Walk/Ride days, access to bike tools, and shower facilities. The combined efforts of the Longwood Cyclists’ Group, Harvard's Commuter Choice Program, and the various school-based bike-initiatives continue to contribute to the level of bike-friendliness and improved measures to create a healthy and safe cycling community on Harvard’s campuses. Kudos! Start pedaling! 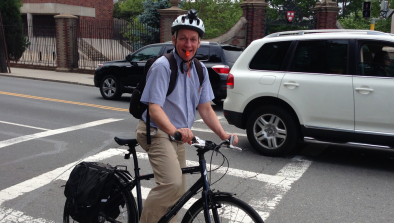 Harvard now offers reimbursements to all bicycle commuters.